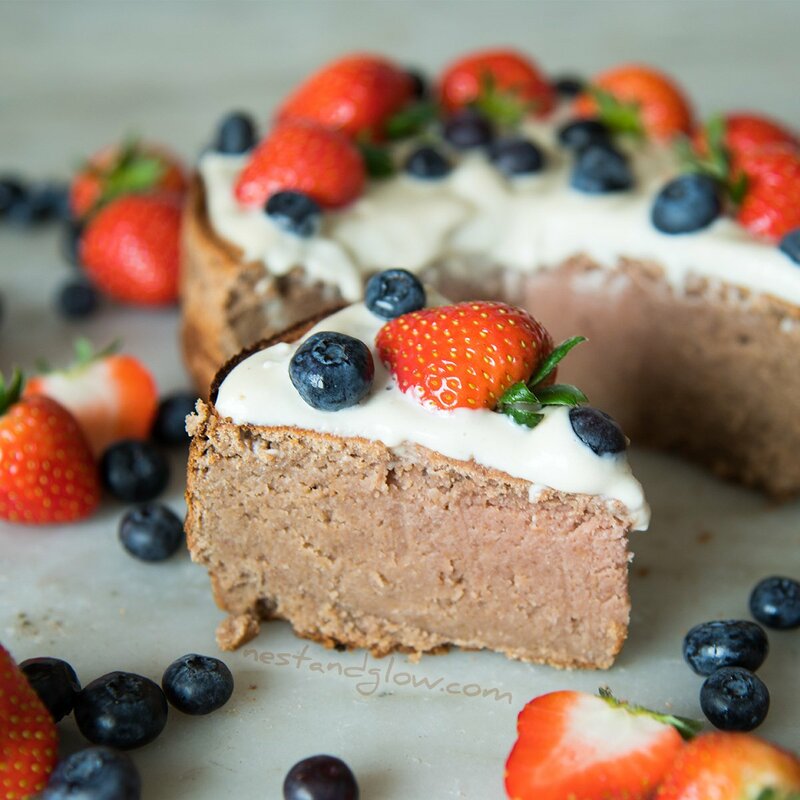 A healthy cake recipe that’s vegan and gluten-free. 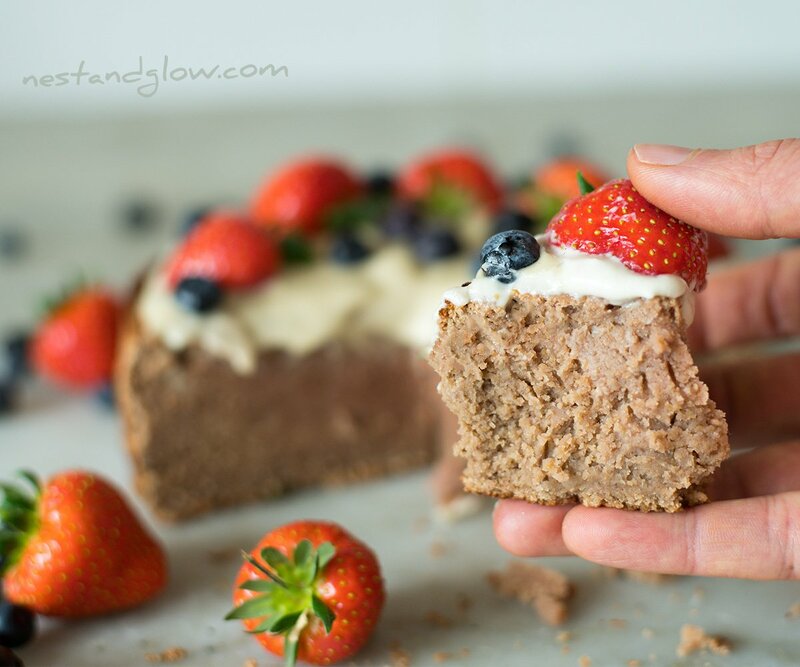 Chickpeas are used so this cake is bursting with fibre and protein. 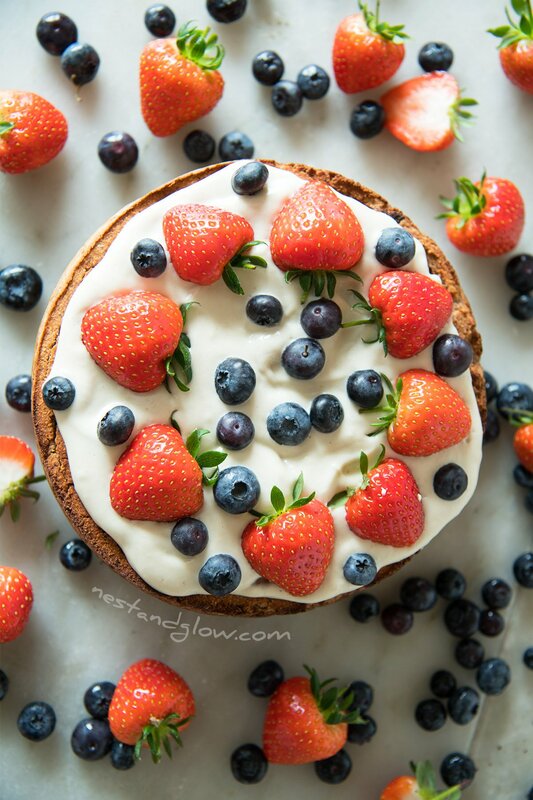 It’s topped with a cashew coconut frosting and fresh fruit. 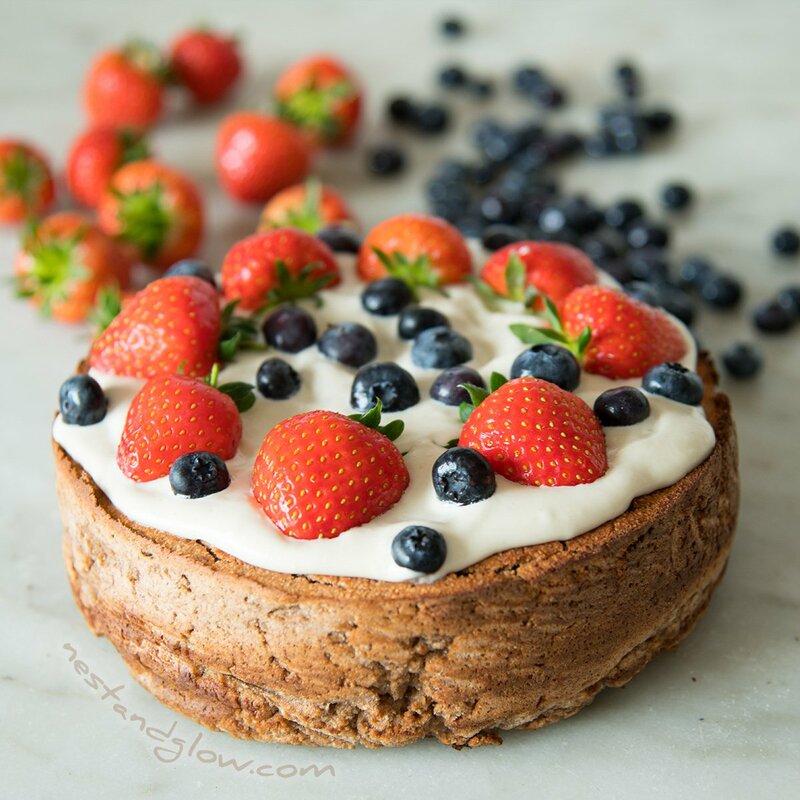 This chickpea strawberry cake is easy to make even though it uses aquafaba. Suitable for plant-based, oil-free, grain-free, gluten-free and general whole foods diets. The main cake is suitable for nut-free diets but you will have to leave out the cashew nuts in the frosting. These can be replaced with just coconut for coconut whipped cream or you can use chocolate avocado frosting. This cake smells beautiful as it bakes with the very fragrant coconut and a hint of strawberry. This recipe is oil free as I’m using coconut flour and no refined oils. You can add some oil with a high smoke point if you are less concerned with a healthy cake. The frosting uses half a can (15oz / 400ml) of coconut milk blended together with enough cashews to make a thick icing. I didn’t add any sugar as I didn’t think it needed it but you might want to adjust for your taste. Cashew nuts and coconut are quite sweet. Unfortunately the cake lost all of its red colour during the baking. After finishing the shooting I realised the way to make it have some colour from the beetroot is to save the beetroot juice and sprinkle on randomly once baked and before icing. The cake has just a hint of strawberries and you taste more the strawberries on top. I did want to use strawberries in this as during testing I found without a fruit it was just missing something. I always like to add a bit of lemon or lime juice to my cakes to cut through the sweetness. You can use either lemon or lime for this. My chickpea cake is high in protein and fibre but free of oil and only contains a small amount of sweetener. Use whatever sweetener you like. I used maple syrup and just a small amount as I don’t like it too sweet. Chickpea / gram flour can be sourced from most supermarkets, health food shops or from Asian supermarkets. 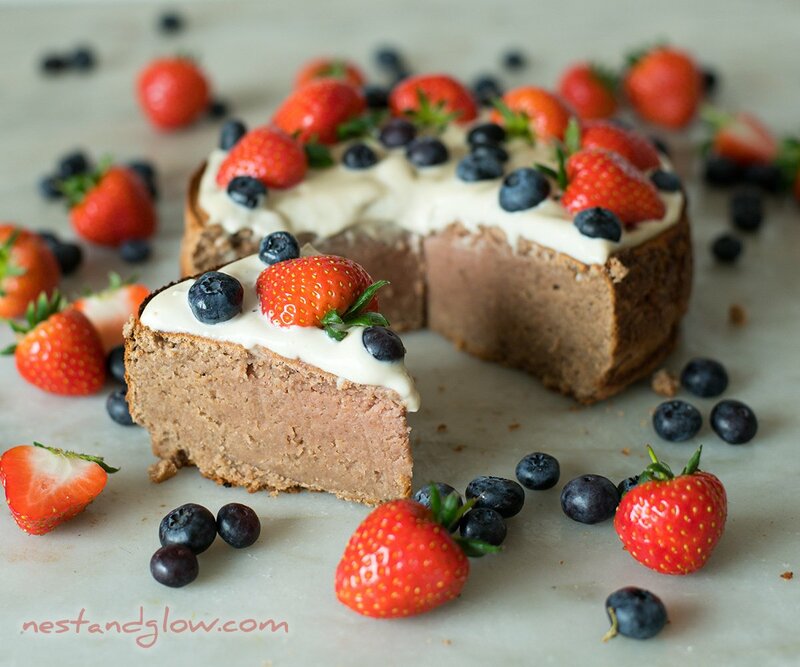 It helps add lots of protein and fibre to this cake and gives structure. It’s important as without this it would just be too wet to hold properly – trust me I tried several times. Chickpea flour is often quite inexpensive from a normal or Asian supermarket. You might want to cut this cake in half and ice the middle. I think that would look very good but I just wasn’t in the mood for trial and error as this was the 6th time I made the cake on the day of shooting. The cake is actually quite robust so could easily slice in half. Or just be made into two sandwich tins. Pre-heat the oven to 375f / 190c. Drain the chickpeas but save all the juice. Grind the flax seeds and then soak in water for 5 minutes. Place everything for the cake into a food processor and blend until combined. Wisk the chickpea juice with an electric whisk for 5-6 minutes until stiff peaks are formed. Gently fold in the cake batter into the chickpea juice aquafaba. Spread the cake into a 7″ lined tin. Bake for 50 minutes, then a knife should come out clean. Blend the cashews and coconut milk together. Use a brand of coconut milk that is separated and drain off 3/4 of the water. Once the cake has cooled remove from pan, cover with the frosting and decorate with fruit. Keep in the fridge and enjoy within 5 days. Equipment: 7″ springform pan, Oven, Food Processor, Greaseproof/parchment paper, Electric Whisk, Bowl and Blender. Has anyone made this yet? I love that it has chickpea flour in it and is gluten free. It looks totally yummy! How much a medium beetroot? In ounces or cups?? About 200g or 7oz, hope that helps! thanks a lot for the recipe of the chickpea strawberry cake. Why is beetroot necessary ? Should this be raw beetroot ? Can I just drop it ? It’s really just to add a bit of colour and I like to hide veggies in food. Either raw or cooked is fine just as long as it’s not in vinegar. I watched the video and the beetroot appeared to be cooked and the strawberries looked frozen. I got some prepared beets at trader joe’s but I will use fresh strawberries since I am in southern california. Do I need to alter the liquid? Hi there, yes the beetroot was cooked and I used frozen strawberries as it was the winter in the UK when I first made this. I would use the exact same amount of berries once the stems are removed as I used the whole berries with the juice that came off after a short defrost. I added strawberries on top but just for decoration as they didn’t taste that good out of season!